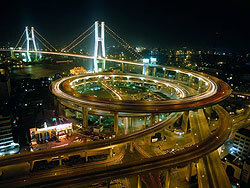 Shanghai is one of the most exhilarating cities in the world. Once the playground of socialites and foreigners, this ever-changing city is now home to local tycoons, rampant capitalism, and all-night partying. Shanghai truly epitomizes the duality China is known for: where yin meets yang, East meets West, tradition lives side by side with modernity. Historical colonial European buildings stand next to soaring skyscrapers and old-style neighbourhoods and temples. Yuppies sip expensive drinks at trendy bars, then hit local dim sum joints. Hot and humid summers bring on nippy winters. A city of contrasts, Shanghai never stops. With a population of over 17 million, Shanghai generates a level of energy uniquely its own. The Shanghainese have the reputation in China as tightwads and status-obsessed. Making money and doing business is in their blood. The pursuit of success and money is glaringly obvious. Those who have it, flaunt it. Businessmen in sharp expensive suits rush off to high-powered business meetings, one hand on the latest techie toy, the other on the wheel of the latest shiny automobile. The beautiful people are gussied up in the best designer duds as they flit from one exclusive party to another. If people aren't busy living it up, they are working hard to make it big so they can live it up. The business and social scenes are truly the heart of this pulsating city. Yet much of Shanghai's success as a progressive city can be attributed to the locals character. Shanghai's fast-moving leadership, intrinsic self-confidence and swelling wealth have put it far ahead of its Chinese cousins. The Shanghainese have an extremely high standard of living, and enjoy China's highest salaries. As one of the first Chinese cities to open up to Western trade, Shanghai is home to a throng of foreign banks, attracting foreign investors who want a piece of the business action. Buildings pop up out of nowhere, more modern with each new high-rise. Shanghai's port is not only the world's biggest, and one of the busiest and most historic. Its prime location between Beijing and Hong Kong gives it a large competitive advantage. Shanghai has long been the birthplace of everything modern in China. It was the intellectual stage for many of the writers who created modern Chinese literature, especially in the genres of socialist and romantic writing. Chinese cinema and theatre also started here. Shanghai's legions of art museums, its spiralling modern architecture and its blossoming cultural scene are testament to its continued ability to stay up-to-date. Yet Shanghai still contains quaint areas. The Shanghai Bund, for example, contains much from the early 20th century, ranging from Art Deco to Neo-Classical. Many areas still retain touches of classical Chinese style, such as the traditional garden of Yuyuan. In line with Shanghai's drive to become a "world city", in recent years incredibly unique, perhaps even architecturally eccentric, structures have risen in Shanghai, such as the Shanghai Grand Theatre, Shanghai Museum and the Oriental Pearl Tower. The Shanghai Grand Theatre is said to be a reflection of Shanghai's Eastern and Western influences "Chinese in symbolism and foundation, but Western in structure. The intentional dualities of the theatre play central roles. Its gargantuan roof and pillared glass surroundings are only a part of its striking modernity. The shape of the Shanghai Museum, on the other hand, resembles that of an ancient bronze cooking vessel. Shanghais" TV Tower, or the Oriental Pearl Tower, is the tallest completed tower in Asia. Unique to Shanghai are its shikumen residences townhouses two or three floors high, each with a front yard, secured by a very high brick wall. These homes are situated one after another along a straight alley, gated by a stone arch. While resembling similar townhouses in Anglo-American countries, they differ in the strong brick gateway in front of each home ("shikumen" means "stone storage door"). These homes were built by city developers adapting the European terraced home idea to Chinese traditions. The walls protected families from the looting and fighting common during the Taiping rebellion, and from the burglaries rampant during the early twentieth century. Shikumen homes are yet another example of the duality found throughout Shanghai, blending aspects of traditional Chinese architecture and social behaviour with Western elements. As with all classic Chinese homes, they have courtyards, allowing privacy from the commotion outside, and letting natural sunlight and ventilation in. Shanghai has a huge mix of religious cultures, as seen in the many mosques, and churches of all Christian denominations and synagogues. And of course a multitude of Buddhist and Taoist temples, both deeply entwined in China's culture. The city of Shanghai contains 18 districts and one county, each area distinct in flavour and atmosphere.